The 112525SBLB Boker Trapper - a classic traditional two blade pocket knife, features clip and spey blades made of Solingen carbon steel with nail nicks for opening. The eye catching Smooth Blue Bone handle, 4 1/4 inches closed, has brass liners, nickel silver Tree shield and nickel silver bolsters. Made in Germany; limited quantities. Looks like Cobalt blue to me. 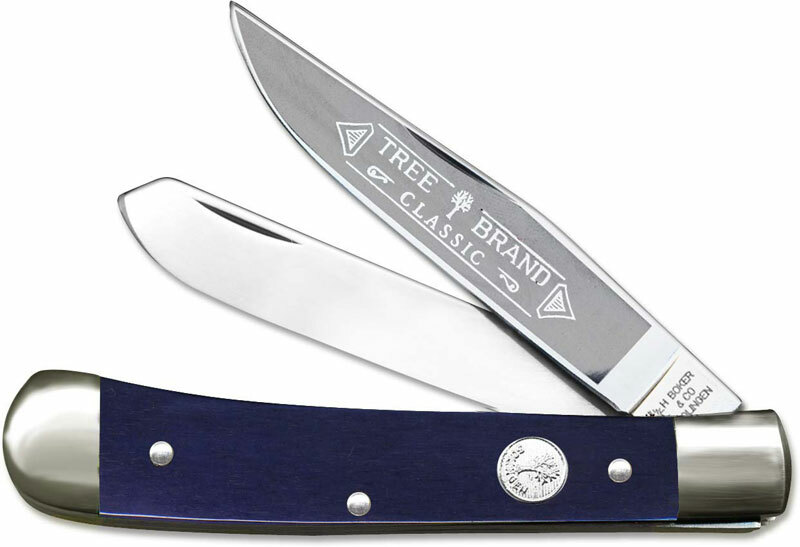 It is the same dye color that Boker Tree uses on the Motley blue trapper , which came out a stone wash purple. Boker Tree trappers are the best production trapper knives on the market. I have one arm and these Bokers knives open like butter for me.